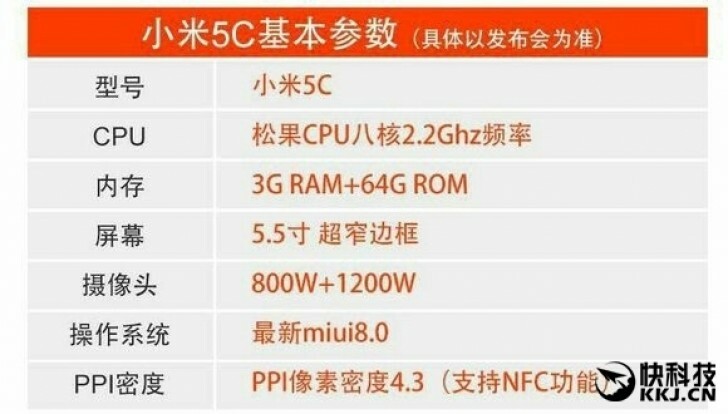 Yesterday we told you about the purportedly leaked pricing for the upcoming Xiaomi Mi 5c. The phone is set to start at CNY 999, which means about $144 or €136. That's a decent price, especially considering that this device will be part of the Mi 5 line. That said, don't expect specs similar to those of the Mi 5s. The Mi 5c will be a lower-end alternative, and today an alleged spec sheet for it has been leaked in China. It tells us that the Xiaomi Mi 5c will have a 5.5-inch touchscreen with narrow bezels, a 2.2 GHz octa-core processor, 3GB of RAM, 64GB of storage, and NFC support. Its main camera will be a 12 MP unit, while an 8 MP shooter will take care of selfies. The phone will run MIUI 8, probably atop Android 6.0 Marshmallow. The CPU will probably have Cortex-A53 cores, and it's said that this might even be an SoC made in-house by Xiaomi. Take that with a pinch of salt though. Past leaks have shown a handset with a fingerprint sensor on the front, and 2.5D glass on top of its screen. The Mi 5c will reportedly become official at an event on November 30, which is next Wednesday. That's the same day on which Meizu is expected to announce its new Flyme OS 6, alongside at least one new smartphone (possibly the X). So Xiaomi seems intent on not letting its competitor have the spotlight all to itself. In which way xperia xz outrun mi mix??? can u explain?